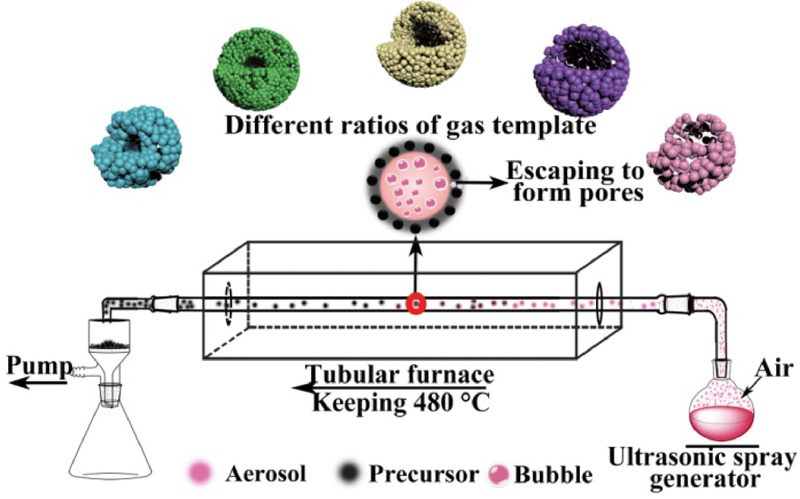 Porous hollow Co3O4 microspheres have been synthesized from a mixed cobalt nitrate and urea solution through spray pyrolysis followed by calcination at 600 °C in air. This porous hollow Co3O4 is assembled by nanoparticles and exhibits variable porosity depending on the amount of gas in the system. In pyrolysis process, urea continuously decomposes into gaseous components, which act as a template to control the porous structure. 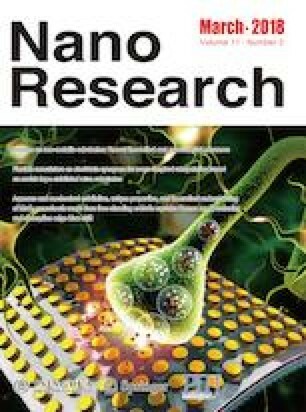 The amount of gas escaping from precursor droplets can directly influence the porosity of the microspheres and the size of the nanoparticles controlled by the ratio of urea to cobalt nitrate. Electrochemical measurements show that the performance of the porous hollow Co3O4 microspheres is related to the porosity and size of the nanoparticles. The sample with optimal porosity delivers a high first charge capacity of 1,417.9 mAh·g−1 at 0.2C (1C = 890 mA·g−1), and superior charge cycle performance of 1,012.7 mAh·g−1 after 100 cycles. In addition, the optimized material displays satisfactory rate performance of 1,012.4 mAh·g−1 at 1C after 50 cycles and 881.3 mAh·g−1 at 2C after 300 cycles. Superior charge/discharge capacity, excellent rate performance and high yield achieved in this study is promising for the development of high-performance Co3O4 anode materials for lithium-ion batteries. Supplementary material (TEM images of Co3O4 microspheres, nitrogen adsorption/desorption isotherm and BJH pore size distribution of samples, specific capacities of S 8-6 at 2C, SEM images at different magnification of S 8-6 after 300 cycles at 2C, and comparison of electrochemical performance of Co3O4 as anode material for the LIBs) is available in the online version of this article at https://doi.org/10.1007/s12274-017-1766-1. This work was supported by the National Natural Science Foundation of China (NSFC) (Nos. 21471006, 21271009), the Programs for Science and Technology Development of Anhui Province (No. 1501021019), the Recruitment Program for Leading Talent Team of Anhui Province, the Program for Innovative Research Team of Anhui Education Committee, and the Research Foundation for Science and Technology Leaders and Candidates of Anhui Province.